An exciting game of paintball is waiting for you right in your living room. Call up your friends and invite them over for a challenging paintball competition, or play solo within your favorite setting and scenario. Plug-and-play technology means gets you set up and ready to go in minutes. Choose your favorite scene from a range of realistic-looking forests, fields and fortresses. Unlock new, more powerful equipment as you master your way through eight levels of competition. 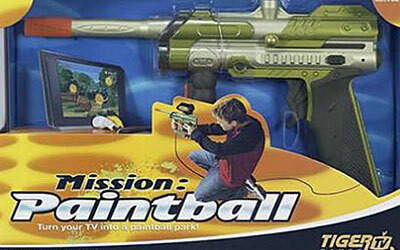 Turn your TV into a virtual paintball park and start playing.